In our last installment we discussed the concept of BIP, or a Buyer-in-Process, and how getting a grip on the investments a company is making in developing potential buyers can lead to finding new ways to reduce costly waste in the sales process while increasing sales productivity. 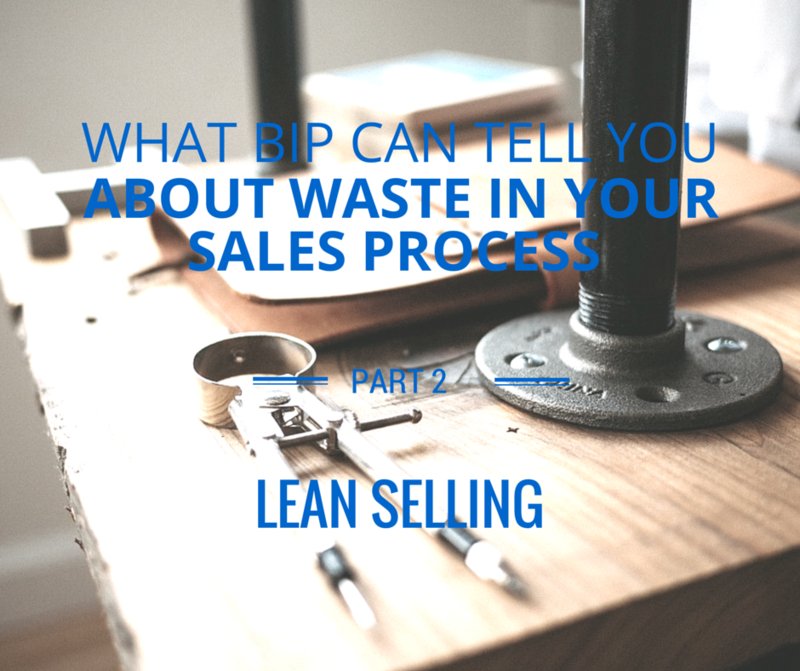 I noted that employing Lean Selling approaches lead to uncovering waste and to understanding where all the value that a company adds during the sales process is going. I also suggested that, before jumping into an implementation of Lean Selling methodologies, it is important to assess where your own sales process is, in terms of the maturity it exhibits. In this article I will introduce three key attributes of processes that will give you a pretty fair idea of where your own selling system stands. These are three of the most important attributes to look at when evaluating your own business processes, including sales. A repeatable process is one that always follows the same steps to get the same results. Most large scale manufacturing and service industries utilize repeatable processes, with different process variations for significantly different products or services. In contrast, for non-repeatable processes, there is no expectation of following the same steps or having the same outcome each time. You cannot improve the efficiency of a non-repeatable process because what is being produced and how it is produced changes each time you execute it. Does this sound like your sales process? While skills of individuals may improve with non-repeatable processes, the overall cost of the selling system will always climb, as you will never find the economies of scale to combat rising costs of labor and wages. You cannot make a non-repeatable process more efficient or cost effective, while a repeatable process can always be streamlined and improved. A scalable process can be sized up—or down—based on market demand or company objectives. You can produce more, or less, with the same process, economically. When delivery of a service is highly dependent on skilled, expensive, individuals, it becomes difficult to make the process scalable. Whenever a single resource (human or machine)—rather than the process—is primarily responsible for producing the product or service, the process will not qualify as a scalable one. Is your sales process overly dependent on rainmakers? Falling into the trap of building non-scalable processes happens in all types of businesses. Examples include a small business built around the unique talents of the founder that grows and then plateaus, to large companies that become dependent on the special brilliance or charisma of their CEO. When the process is not scalable, the company or department cannot grow without increasing the amount of resources injected into the process. A scalable process does not rely on the unique or rare talents of a single individual; it can deliver more with the same—or fewer—resources by increasing process efficiencies and effectiveness. An optimized process is one that is working at a speed, cost, and quality level that has been improved to be more efficient than it was previously. Non-scalable and non-repeatable processes cannot be optimized; they’re too random or dependent on individuals. When you have repeatable, scalable processes, however, you’re able to break them down into component steps and the entire process can be optimized for maximum effectivity and productivity. While focusing on a single, expensive resource of a process may seem to make financial sense (getting the most out of what you’ve spent the most on), the reality is you need to look at the output of the process as a whole, without putting too much focus on a single step. True optimization happens for the entire process, not just for each step in isolation. Is your sales process optimized for the benefit of overall long-term company objectives or for individuals and short-term organizational targets? Repeatability and scalability are necessary to pursue optimization at a system level, and all three of these are characteristics of Lean processes. A Lean process enables your company to look into the elements of your processes, understand how it is working—or not—and make it better. If you can’t identify the problem areas, you can’t improve them, and that is where Lean approach provides breakthroughs. A Lean Selling process does the same for your selling system, removing the guesswork of what works and doesn’t work and replacing it with a predictable, revenue-generating machine. Why is looking at our sales process from these three perspectives of repeatability, scalability, and optimization critically important to businesses? Because there is a lot of bottom-line profit at stake. In manufacturing, items that move through the process are called “work-in-process”, or WIP, which is carefully tracked, at least in larger organizations. Each step has quantifiable amounts of resources that are added to the product, and are ideally accounted for in the financial system as inventory. Waste and actual cost per step can be determined. In service companies, the cost of labor is captured, but generally is not an element of management reporting during the delivery process. In sales, the analog for the value added to (or investment made in) buyers moving through the sales pipeline I call “Buyers-in-Process”, or BIP. The difference is that, in sales, cost is tracked by companies as a blanket expense, and it is extremely rare that management can identify which investment in a particular buyer was worth the investment of resources (or not worth it, in the case of lost sales). The only exception to this may be for the case of selling very-high-end capital equipment to a handful of customers, often in the form of RFPs. If you take a step back and consider the buyers (BIP) in your pipeline as potential assets (inventory) reflecting the investment of time and money that you have already put into them, it may shock you to contemplate the total amount of investment just sitting there. More than half this investment will become waste in the average sales process. The result of applying a Lean Selling approach to your sales process is that you will be able to evaluate your own selling system in this way. Drilling down into the selling system your company uses can help you identify exactly which steps in the process are creating the most waste. However, before embarking on a Lean Selling journey, you first must determine whether your sales process meets the basic criteria of a mature process in the three areas discussed above. 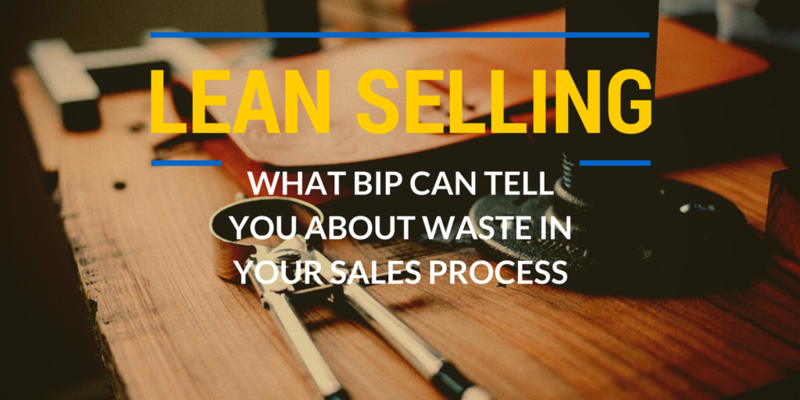 How can Lean Selling help to unravel the mystery of BIP? More on this in the next installment.